I saw this movie a while ago, but I am only just now getting around to writing a review. 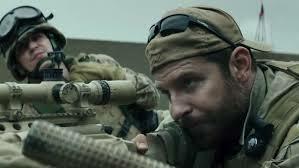 When I first heard about American Sniper, my initial reaction was, ‘Oh, it’s Clint Eastwood.’ I mean, look at Changeling, Gran Torino, Invictus, J. Edgar, Trouble With The Curve, Jersey Boys… they all underperformed. Why should this one be any different? Well, the general consensus is that this film is actually good. But, is it? I have made it clear by now that I’m not exactly a fan of the war movie genre. And this film is not what I would call the exception to the rule. The story has a lot of cliche and the whole ending just feels rushed. But with that said, there are moments film does do a good job of putting you into Chris Kyle’s head, and in the scenes when he’s home there are a few quietly powerful scenes, such as the bit with the drill. I would say the strongest element of the film is Bradley Cooper, who turns in a very good performance given the material he has to work with. It’s a fine performance and given his Oscar track record, it seems highly likely that he will get an Oscar at some point in his career. However, outside of Cooper and admittedly good sound design,the film doesn’t have that much to offer. Now a lot of people do like war movies and a lot of people did really like this movie. If you are a fan of the genre, you can probably watch this with no problem. This is just my personal rating, and you should take it for what it’s worth. I totally disagree. I think the film portrays what a soldier (a sniper) goes through to save ohter American fighting men…the toll it takes on him and his family but is justified by the lives he saves. I respect your opinion, well just agree to disagree.